More than 10 percent of water resources in the Mediterranean basin have boron levels that exceed E.U. standards for drinking water. Understanding the source of the problem will help countries better manage their groundwater and, in some cases, overcome conflict. In Albuquerque, N.M., increased development is sucking up the region's scarce groundwater, leaving communities to vie for precious water rights. 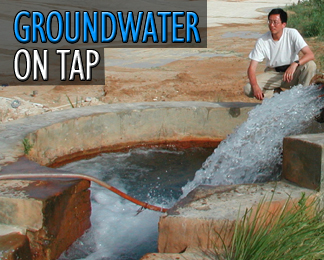 Throughout the United States, people are increasingly turning to groundwater resources. Nowhere is that more true than in the West, where aquifers are rapidly dwindling. Click here to read Geotimes' ongoing coverage of exploration of the red planet. Researchers take an integrated approach to studying the flow of chemical contaminants from the Mississippi River into the Gulf of Mexico. Sustainable water management will only be possible through science-based policy-making. Choosing the right contact in Congress to help move your issue forward is key to successful lobbying. Now on display: a fossil treasure Hurricane Isabel uncovered in a stretch of cliffs along the Maryland coast during its destructive course. New survey results reveal the many factors that affect a female geoscientists chance to reach tenure as a professor in the United States. Following some simple steps may ensure your departments survival. Groundwater aquifers are an important source of drinking and irrigation water around the world  particularly in the desert. Here, Zheng-Tian Lu, a physicist at Argonne National Laboratory in Illinois, inspects an artesian well at Farafra Oasis, in the Western Desert of Egypt. Lu led a team that dated the oldest water in the Nubian aquifer, a vast expanse of groundwater below the Sahara Desert. See story and features for more about groundwater investigations throughout the Middle East and the western United States (to be posted later this month).